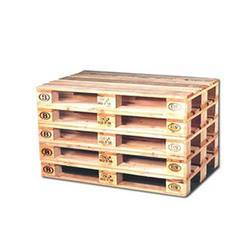 Our Pinewood Euro Pallets are made in strict compliance with the standards of European Trade Institute (EHI). High grade pinewood that is pre heat treated is utilized in making these pallets that excel in both the quality and performance parameters. The Euro Pallets are available in different sizes and are safe for most of the distribution and transport applications in Europe. These pallets are specially provided with collars and lids that transform it into stackable boxes that are considered ideal for storage and transport of small mixed or fragile loads.